Clay thin brick is LOPO’s most classic architectural clay product. With more than a decade’s continuous research and innovation, LOPO has added diverse color and texture options and premium physical property to this traditional construction material that first appeared several thousand years ago. Metallic Series and Handmade Series are two most outstanding series of LOPO’s clay tile. Metallic Series clay thin bricks radiate natural cast iron-like color on the brick surface. This color results from metal oxides being reductive during firing, and has very special visual effects. Hand-molded clay thin bricks are pressed manually in order to form natural and diverse textures to the most extent; those irregular textures make the entire exterior wall more natural and aesthetic pleasing. Bricks for corner and windowsill are available for each series. Clay thin brick with metallic sheen surface is created by using metal oxide in the reduction firing process,which offer a unique design elements for the building facade. The texture of hand-molded brick slip is completely created by hands. Each piece is unique and aesthetic. The surface of Matta Texture series contains fine grains of sand and irregular marks. The surface of the clay tiles adds a bit of rough texture, which can create unique facade grades for various public buildings and private houses. LOPO Natural Flat series is one of most classic clay thin brick series. The surface highlights the natural beauty of clay, and the color of tile is mild and gentle. It renders an enduring sense and stands well to the test of time. 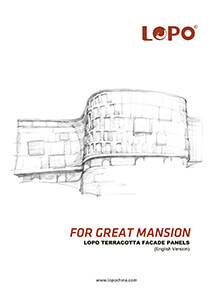 LOPO creates unique flashing surfaces of restored series by adopting special reductive firing technique. The brick surface presents several different shades. The color transition is natural and through different combinations which can render a variety of different facades. Frosted Texture series applies special technique to sand the clay tile’s surface. Its roughly sandblasted surface brings you to the past and its color renders a nostalgic sense. Rock surface, sand surface, weathering surface and other rough surface texture can be achieved. Zephyr Texture series is tailor-made terracotta tiles with special surface treatment manufactured by LOPO for Japanese designers and Japanese architecture. The surface has treated with multiple processes, showcasing various textures, such as wood grain surface, water erosion surface and clay surface. Linear Texture series clay cladding tiles cover a wide range of thickness with regular or irregular, horizontal or vertical line texture. They can be used for facade to achieve special visual effects by extending the silhouette horizontally or vertically. Special Shape series are tailor-made clay thin bricks by LOPO for certain architectural projects. LOPO can customize the products in terms of their shapes, colors, sizes and surface textures as required, helping architects complete each project in a unique way. 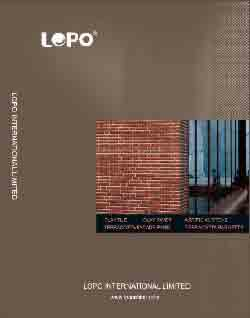 LOPO also provides Brick Cladding System. Different from conventional clay thin bricks that are pasted by cement and mortar, brick cladding system series adopt mechanical fixing system that makes clay thin bricks applicable for the facades of high-rise buildings. Clay thin brick designed for the system has specialized profile that can be incorporated into the system. 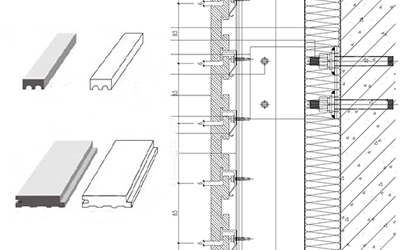 LOPO can design a specific installation system according to actual facade structure and curtain wall design requirements.